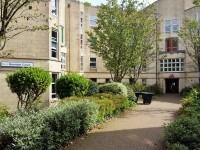 Services / facilities within the building include catered undergraduate accommodation. 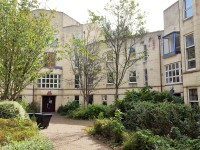 This venue is situated in Bath. 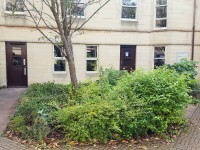 The nearest mainline station is Bath Spa. 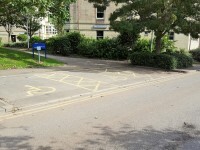 There are 3 designated bays for disabled residents, located at the front of the courtyard, 34 - 37m from the main entrance. 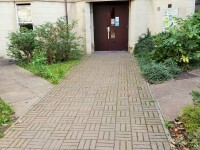 This information is for the entrance located in the centre of the courtyard. 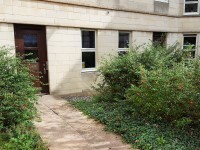 There are a further 2 entrances into the building either side of the courtyard, accessing different groups of rooms. These do not have automatic doors. 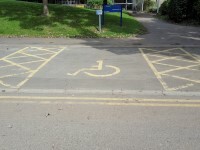 The ramp/slope is located in front of the entrances. 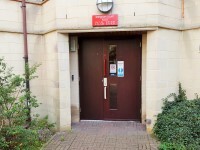 The doors along the ground floor corridors either side of the main entrance are automatic, including into the Social Space (shown in photograph 3). 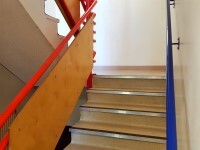 The floors which are accessible by stairs are G, 1 and 2. 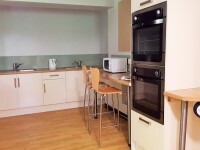 The establishment provides 4 accessible accommodation facilities with an ensuite and/or separate accessible bathroom. 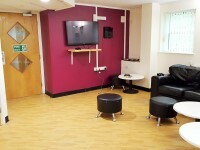 The accessible facilities are located on the ground floor, off the corridors either side of the main entrance. The room number viewed was 1.7. 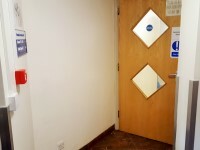 The width of the door to the room is 86cm (2ft 10in). 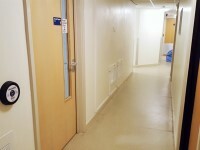 The dimensions of the clear floor space are 185cm x 260cm (6ft 1in x 8ft 6in). The bed is 56cm (1ft 10in) high. The measurement between the bed base and floor is 29cm (11in). 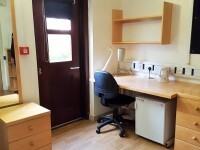 Other accessible facilities available in the bedroom are an automatic door into the room from the corridor, a grab rail by the desk and a drop down rail by the sink. 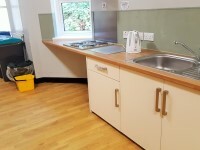 Other accessible facilities available in the accommodation are automatic doors into shared bathrooms and kitchens, lowered and accessible surfaces, hobs, sinks and ovens in the shared kitchens. The information relates to the shared bathroom. The dimensions of the bathroom are 230cm x 297cm (7ft 7in x 9ft 9in). The width of the door to the bathroom is 86cm (2ft 10in). 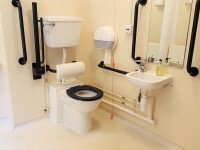 The height of the wash basin is 73cm (2ft 5in). The measurement of lateral transfer space is 150cm (4ft 11in). The type of shower controls used are lever. 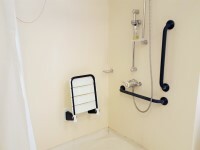 The shower seat height is 48cm (1ft 7in). 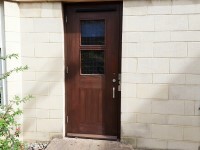 The colour contrast between external ensuite / bathroom door and wall is good. The colour contrast between the internal bathroom door and wall is good. The colour contrast between the walls and floor in the bathroom is good. Students can bring in their own bed if required. 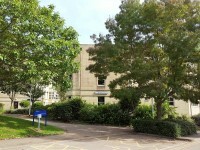 You are on Outside Access (Room 1.7 External Entrance). Skip to the next section. 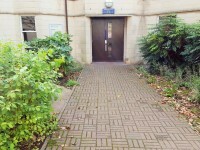 This information is for the entrance located off the courtyard, to the left of the main entrance as you face it. 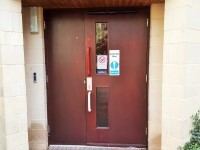 The width of the door opening is 78cm (2ft 7in). 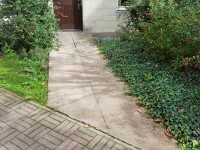 The width of the ramp is 122cm (4ft). 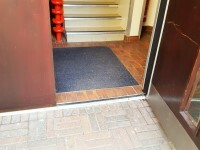 This entrance leads directly into the room, so is only accessible to the room resident. All 4 accessible rooms have identical entrances.